You've heard that you should eat more kale. Now a small but growing industry wants you to eat more kelp. Seaweed production has long been a big industry in Asia. But recently, American entrepreneurs have launched new enterprises that grow fresh and frozen seaweed right here in the States. Just off the Maine coast, I caught up with Peter Fischer, Peter Arnold and Seth Barker, whose new venture, Maine Fresh Sea Farms, is yielding its first full harvest. From a small skiff out in the clean waters of Maine's Damariscotta estuary, they winch up a rope that's heavy with floppy sheets of glistening kelp. Back in September, they set tiny starter plants of three varieties of edible seaweed out here: kelp, dulse and alaria. Now they have several wide lines of biomass that extend out for yards, bulging just under the water's surface. "These have been growing really fast," Arnold says, marveling at the seaweed's speedy growth. "Some of them are well over 10 feet." These men are all older than 65, and they've worked various marine endeavors for decades. They've watched the decline of some of Maine's traditional fisheries: sardine, cod, and more recently, shrimp. For this latest venture, they're getting some financial help from the National Oceanic and Atmospheric Administration, and from a local nonprofit development agency. Arnold says the hope is that seaweed farming can boost and diversify existing infrastructure and expertise in the state's seafaring communities. "No one was really doing fresh, at least here in this market," Arnold says. "So we thought, 'That's an opening.' "
Maybe they've found one. The greens are selling for up to $15 a pound at retail; restaurants pay a bit less. Another Maine company, Ocean Approved, is selling truckloads of frozen Gulf of Maine seaweed to hospitals and schools — including the universities of Iowa and Texas. People have foraged wild seaweed off the Eastern Seaboard for centuries. And some small businesses have grown up around harvesting wild seaweed for human and animal consumption. But now a much more active effort to grow seaweed in the U.S. is afoot. "You know what? Kelp is the new kale," says Barton Seaver, who directs Harvard's Healthy and Sustainable Food Program. A former D.C.-area chef, he's all-in for seaweed and has even published a seaweed cookbook. "Watch out, 'cause it's coming, and it'll be everywhere in the next decade," he says. The virtues of macro-algae are many, in Seaver's eyes: They require no fertilizer, no pesticides, no fresh water, no arable land. Their nutritional profile is admirable, he says, providing healthy doses of iodine as well as potassium, calcium and other micro-nutrients, protein, soluble fiber, and Omega-3 fatty acids. And seaweed's benefits aren't just for humans. It's quick growth means quick carbon dioxide uptake, which can reduce ocean acidification. Seaweed can filter excess nitrogen and phosphorous from the water, too. 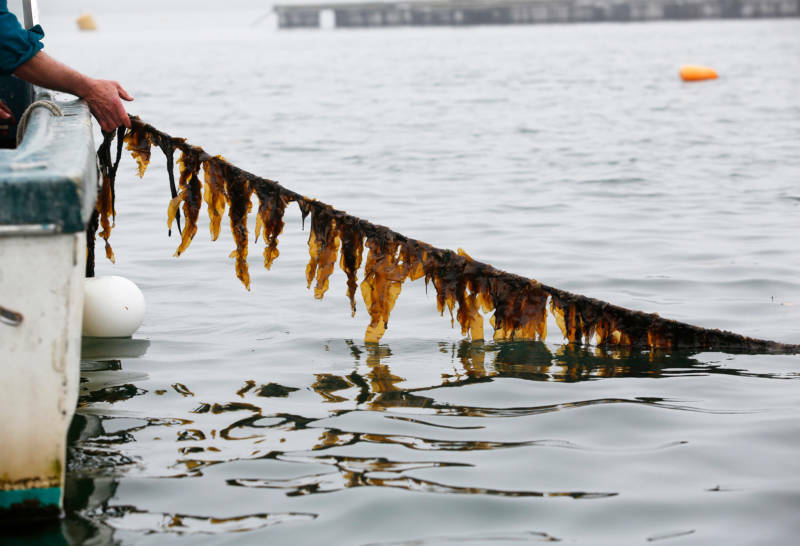 A National Oceanic and Atmospheric Administration-funded project in Washington State's Puget Sound is aiming to prove that farmed seaweed can create a "protective halo" around stressed sea habitats. It's not just a sustainable crop: Seaver says it's restorative. "And that's a very real difference and a major evolutionary point in the sustainability dialogue," he notes. "We're not at a point where we're just focused on doing no harm. We're really beginning to investigate and discover food-production methods that allow us to restore and heal environments." "And," Seaver adds, "it's delicious." "I grew up in Maine, and this is what you used to abuse your younger sister on the beach — whipping her with kelp," says Neal Harden, the chef at a soon-to-open vegetarian version of New York City's Michelin-rated ABC Kitchen. He acknowledges that seaweed can seem like a funny choice for haute cuisine. But Harden says he loves the stuff. "It brings a sort of brininess and this oceanic flavor," he says, as he tosses together dressing for a fettuccine dish he's developing for his new restaurant. "This dish just has so much umami, between the giant hen [of-the-woods] mushrooms I just threw in there and the seaweed." Harden has been looking for a source of fresh ocean greens for his new menu. He says he's lucky to have found the Maine product, which he plans to incorporate into several dishes — including the fettuccine and a morel and dulse salad — while it's in season (seaweed grows best in the colder months). He's not the only one getting into kelp. Several chefs in Maine's vibrant food scene, true to the locavore ethic, are giving Maine sea greens a try. The collective American palate may still take some time to fully embrace farmed U.S. macro-algae. But if the seaweed revolution hasn't quite arrived yet, like the kelp in Maine's Damariscotta River, it's showing some pretty rapid growth.